After a whirlwind, and incredibly exciting 48 hours in Tokyo, we hopped on a plane and 8 hours later found ourselves landing at Changi Airport in Singapore. Continuing our crazy tour of Asia, we had planned 36 hours in Singapore to see and do as much as we could. Luckily, we’d been to Singapore 3 years prior and had a good feel for the city and the country. There were a couple of items that were on our “to see” and “to do” list other than just spending some time relaxing, walking around and enjoying the vibrance of this amazing place. One of the items on our “to do” list was to eat at a certain restaurant located within the Singapore Botanic Gardens. 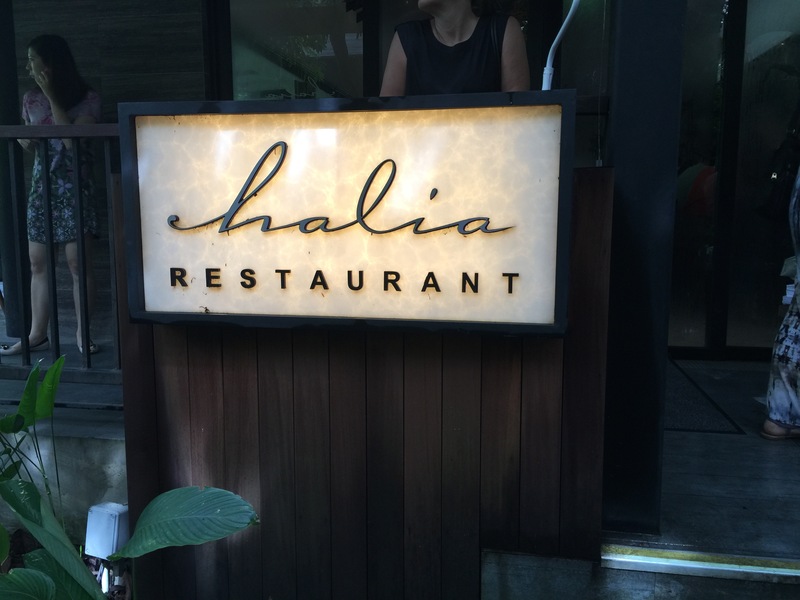 Three years ago, when we came to Singapore, we wandered from our hotel to the Singapore Botanic Garden and came upon Halia, a gorgeous indoor-outdoor restaurant set amid Ginger Garden within the grounds of the Botanic Garden and right next to the National Orchid Garden. Not only was the restaurant set in such a beautiful setting, the food was absolutely amazing and one of our most memorable experiences of our previous trip to Singapore. So, when we made plans to return to Singapore this year, my husband and I both decided we needed to go back to Halia and have another meal at this amazing restaurant. This time around, we were in Singapore during the weekend, so instead of a lunch meal at Halia, we arrived right in the middle of brunch. The restaurant is incredibly popular and when we arrived for brunch all of the indoor and outdoor seating was taken, so we had to wait a few minutes before we were seated at the outdoor patio. It was quite warm and humid, as it always seems to be in Singapore, but something about being in the middle of this garden setting on an outdoor patio deck felt soothing and peaceful. So, sitting out on the outdoor patio may have been soothing and relaxing, but it was still outdoors in the middle of the Singapore heat, so we needed some refreshments to cool us off. I chose the chilled lemongrass ginger infusion. Being in the middle of the Ginger Garden, it’s not a surprise that many of the Halia’s offerings of food and drink featured the fragrant and vibrant flower. In this case, it was a combination of ginger and lemongrass, a little sweet, a little tangy and a whole lot of good. 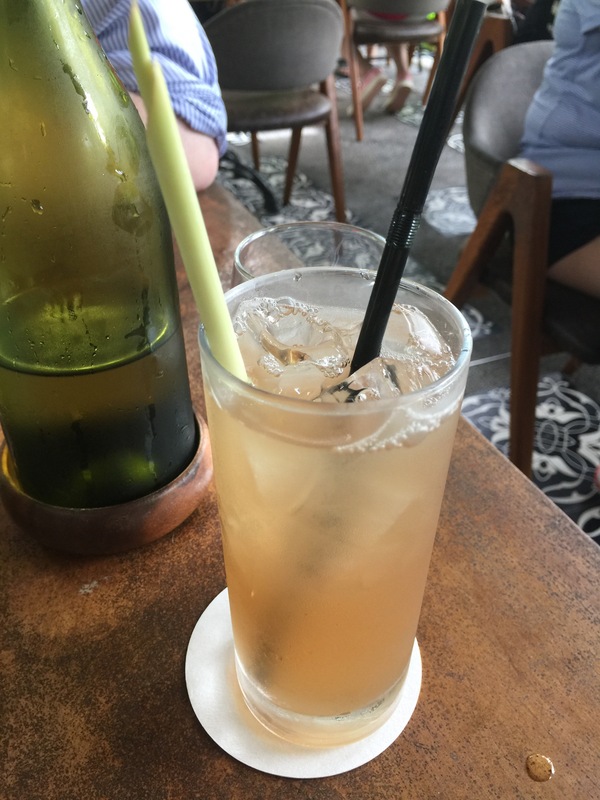 Served with a stalk of lemongrass right in the drink, I could taste both the lemongrass and the ginger flavors with every sip. The drink was light and sweet and really refreshing. The ginger is really highlighted at the end when you get just a little bit of a ginger bite as an aftertaste, and it was nice. I really enjoyed this drink. 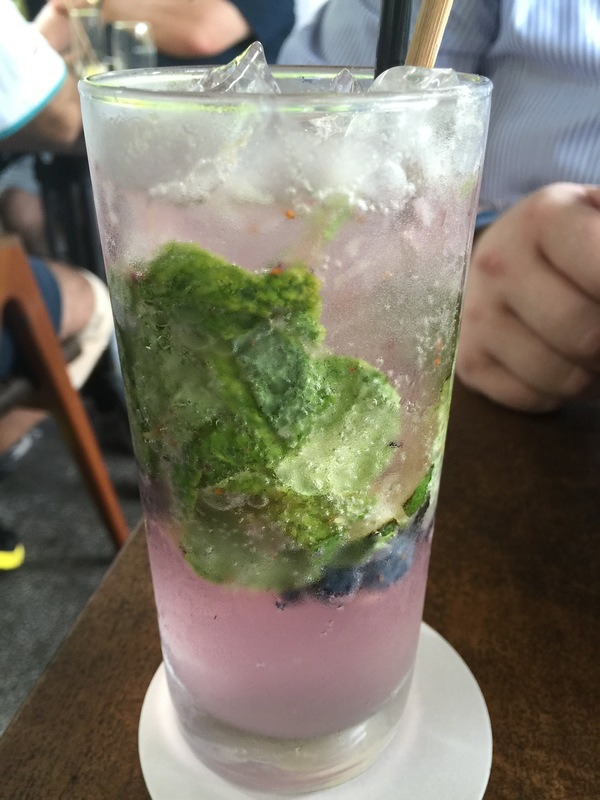 My husband ordered the Halia mint berry made with ginger, mint, lime, blueberry and a little sprite for sweetness and bubbly. This was a beautiful drink with the mint leaf served int he drink. It looked a bit like a blueberry mojito. My husband said that the blueberry taste is what hit him first when he took a sip of the drink, and for him, that was great as blueberry is one of his favorite foods. After the blueberry came the mint flavor and both flavors were quite distinctive. The lime added a twist of tang which goes well with the bubbly carbonation of the sprite. My husband felt his drink was quite refreshing as well and was much tastier than he thought it would be. Even though we were there for brunch, it was pretty late in the morning and pretty much approaching lunch time, so instead of ordering lighter breakfast food, my husband I both decided to order more substantial lunch food. My husband already knew what he wanted since he essentially ordered the same dish when we went to Halia 3 years ago. 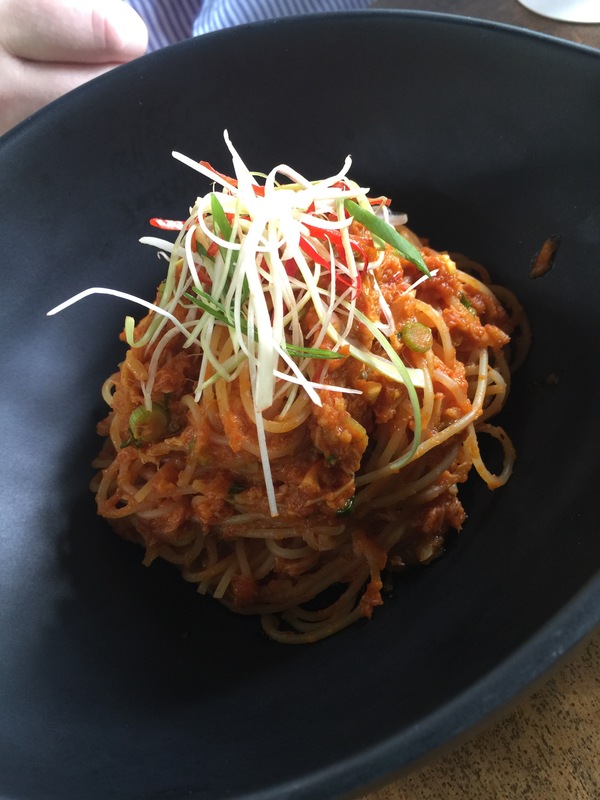 The chili crab spaghettini is one of Halia’s signature dishes and it is their play on Singapore’s national dish of chili crab. Turning chili crab into a dish served with spaghettini is a terrific fusion combination. The spaghettini makes the dish substantial enough to fill you up and the chili crab sauce is a terrific substitute for marinara sauce you’d find with pasta. Using pasta rather than serving with chili crab with rice is just a different variation on the dish and changes things up since rice is the most commonly used accompaniment with most dishes in Asia. My husband, like when he enjoyed this dish 3 years prior, loved the chili crab spaghettini. He felt that the dish had just the right amount of spice – a little heat to open up the taste buds and add a ton of flavor, but not so much that it was so spicy you couldn’t taste the dish. This is what he was looking forward to on our return trip to Halia, and he was so happy that it was just as good as he remembered it to be. To split, my husband and I decided to order a side of truffle fries with our meal. Truth be told, my husband is a sucker for anything with truffle oil, so I wasn’t surprised at all when he suggested to me that he wanted to order the truffle fries as well. 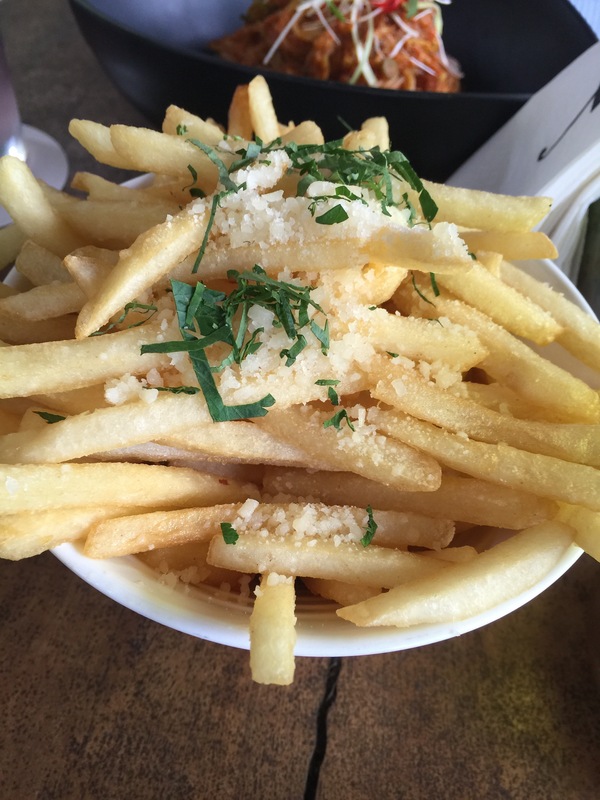 As described on the menu, the fries are topped with parmesan, parsley and white truffle oil. When they were brought to the table, not only did they look amazing, they smelled amazing too. Just a little white truffle oil goes a long way. And this was quite a large order of fries as a side dish. The fries themselves had awesome crunch, which was terrific. If you’re going to load toppings on fries, they better be crunchy and not soggy and soft. There was actually a good amount of truffle oil on the fries, but not to the point where it was overwhelming. You could taste and smell the truffle oil in every fry, but the flavor was amzing. It was a great side dish to just munch on fries while we enjoyed our food. For my meal, since it was so hot out, I wanted to go with something a little lighter. I chose the lemongrass and ginger tiger prawn salad. 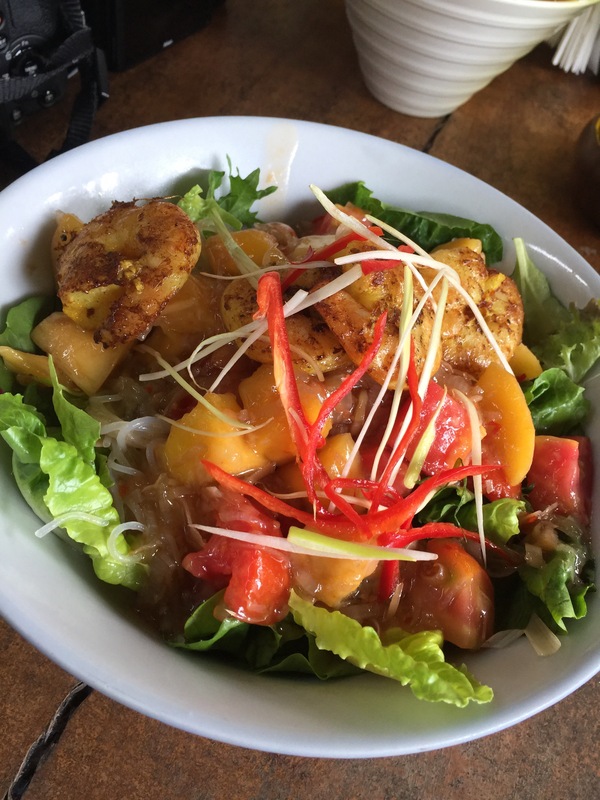 Made with fresh mango and tomato salad, glass noodles and ginger flower dressing, this dish contained a bunch of ingredients that I enjoy such as ginger, mango and prawns, so I was curious as to how the salad would come out. Combining glass noodles in a salad with greens was something new to me, but it actually really worked. The salad was chilled, and light, which really was perfect given the weather in Singapore. The tiger prawns were plentiful and of a really large size so it felt substantial, but it wasn’t heavy. The mixture of crisp greens and glass noodles really was a good match and the ginger flower dressing really brought everything together. The glass noodles were fragrant and flavorful having been combined with the ginger dressing. The fresh mango and tomato salsa was sweet and tangy and very light, but packed a flavor punch. The salad was quite refreshing and I adored the large chunks of fresh mango – after all, mango is my favorite fruit. This was a terrific salad and hit the spot exactly. Halia was just as good as my husband and I had remembered it being from our previous trip. We were glad that we made the decision to come back to Halia again. Though, the decision was a no-brainer as we knew we wanted to get back to the Singapore Botanic Gardens. On this hot, and humid (though what day in Singapore isn’t?) day, Halia’s cool ginger-inspired drinks provided a nice respite from the steamy weather. The chili crab spaghettini was exactly what my husband had longed for, and the lemongrass and ginger tiger prawn salad is exactly what I needed. You can bet that if we make a return trip to Singapore again in the next couple of years Halia will be on the top of our list for another meal.